Mayan pyramid in Chichen-Itza, Mexico. Space observations provide clues as to how ancient civilizations, like that of the Mayans and the Old Kingdom of Egypt, collapsed. Source: Shutterstock. The search for the fabled city of Ubar began with a cold call to NASA’s Jet Propulsion Laboratory (JPL) in 1982. Documentary filmmaker Nicholas Clapp had heard stories about a lost settlement in the Arabian Desert that was once teeming with riches. At some point many centuries ago, Ubar had disappeared into the sand and Clapp wondered if he might use NASA spacecraft to look for it. 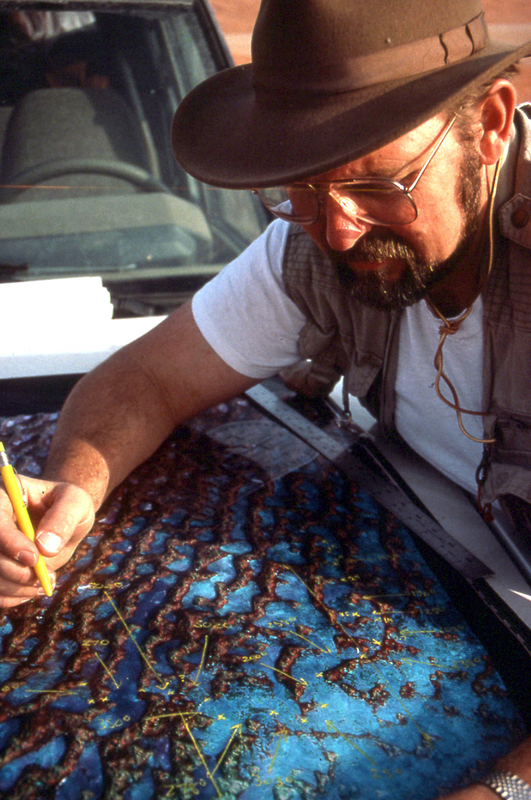 Using Clapp’s historical research as a guide, Blom and his team used the space shuttle Challenger to take images that allowed them to detect ancient tracks in the desert. Some of the roads ran beneath modern sand dunes but all of them converged on a central point: in southern Oman in the Middle East. There, archaeological excavations showed that the team had indeed located a site that matched some descriptions of the legendary Ubar, which it turned out had actually been an important water source and a desert outpost where camel caravans assembled to transport frankincense. Shifts in climate – both large and small – are at least partly responsible for the rise and fall of many ancient civilizations. Once surrounded by mighty towers that eventually sunk into the sand, Ubar is just one in a growing list of ancient sites that are emerging with help from satellite imagery. Also known as “remote sensing data”, images taken from high above the surface of the Earth can show subtle signs of long-lost societies that are impossible to see from the ground. This pair of images from space shows a portion of the southern Empty Quarter of the Arabian Peninsula in the country of Oman. 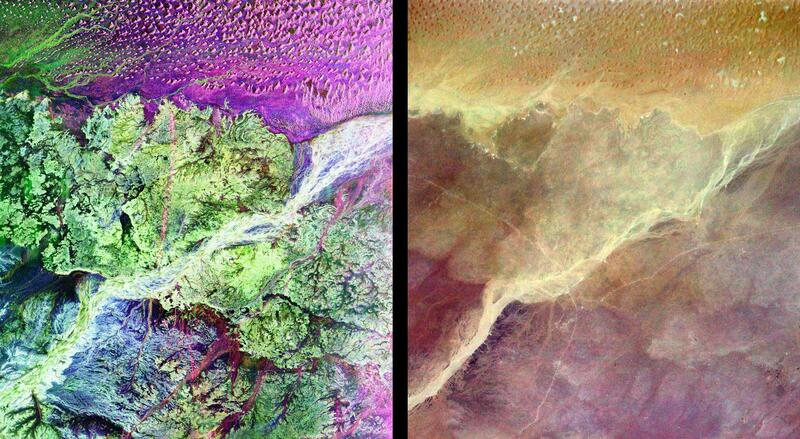 On the left is a radar image of the region around the site of the fabled Lost City of Ubar. On the right is an enhanced optical image taken by astronauts onboard the Space Shuttle. Credit: NASA/JPL. As scientists dig in to these sites, they are turning up evidence that changes in climate – both large and small – are at least partly responsible for the rise and fall of many ancient civilizations. Even though Ubar is now located in one of the driest places on Earth, the region was once much wetter and underground water sources were plentiful. Ubar disappeared when water levels dipped so low that a sinkhole formed and enveloped the outpost. An Egyptian kingdom, likewise, collapsed during an extended drought 4,200 years ago. Droughts have also been linked to the fall of the Maya around 900 AD and the demise of the spectacular Cambodian city of Angkor in the early 1400s. A stable climate ensures crops grow year after year, and a reliable source of food frees people to settle down and develop culture. It’s not surprising that climate change has doomed so many populations, Blom says. After all, it was when weather patterns finally became predictable about 11,500 years ago that complex civilizations finally formed in the first place. A stable climate ensured that crops would grow year after year, and a reliable source of food freed people to settle down and develop culture. Since then, many civilizations have blossomed into greatness and subsequently disappeared into rubble. As scientists try to piece together the history of where people lived a long time ago, they are increasingly turning to the most modern of technologies: spacecraft that offer an unprecedented view of Earth from above. There are a variety of ways to spot long-buried settlements in satellite images. In the search for Ubar, Blom and colleagues used computers to enhance images taken in the visible and infrared wavelengths, as well as with radar, allowing them to peer up to 15 feet beneath the surface of dry sand. As they analyzed the sizes and proportions of dust, rocks and sand grains, they could see the boundaries of ancient roads. When we excavate the remains of past civilizations, we rarely find any evidence that they made any attempts to adapt in the face of a changing climate. I view this inflexibility as the real reason for collapse. 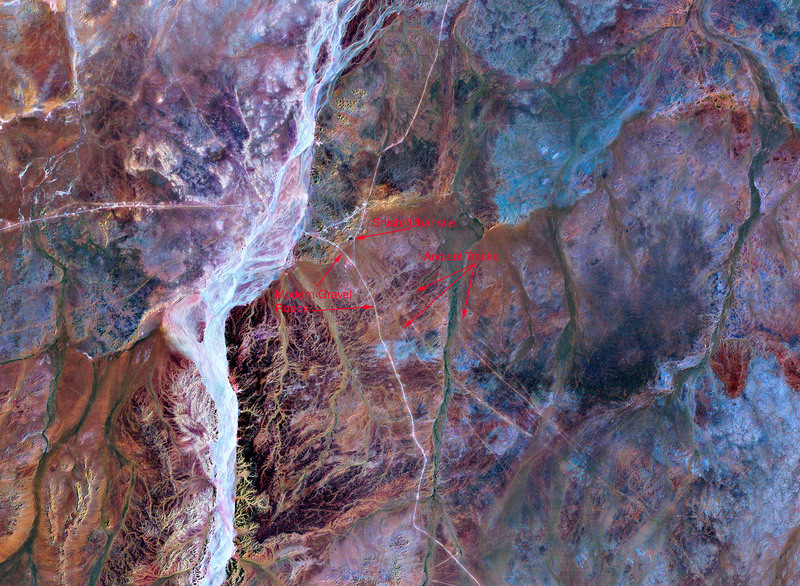 Modern roads and ancient tracks in Oman, as seen from space by the Landsat satellite. Credit: NASA/USGS. In modern-day Iraq and Syria, Harvard archaeologist Jason Ur and colleagues have used NASA satellite images to identify thousands of possible locations for ancient Mesopotamian cities by looking for patches of lighter, drier soil. Those spots indicate where mud brick structures may have collapsed. In the case of the Maya and other lost cities in Central and South America, the jungle is quick to grow over ancient buildings and other structures, but scientists look to satellite imagery for slight differences in vegetation patterns. Where once there was development, the soil is stressed enough to support plants that are different from those growing in untouched soils. Seeing those vegetation shifts from above helps archaeologists zero in on where to dig. As archaeologists continue to turn up ever more signs of collapsed civilizations, they are finding plenty of evidence that climate shifts are at least partly to blame for the decline in many cases. Those links offer the opportunity to protect the future of our own society by learning from the mistakes of our ancestors. • Earth’s climate has been stable for the past 12,000 years. This stability has been crucial for the development of modern civilization. • A stable climate enabled humans to pursue agriculture, domesticate animals, settle down and develop culture. • Space observations, combined with archaeology and climate science, give us clues as to how ancient civilizations, like that of the Mayans and the Old Kingdom of Egypt, collapsed. • Climate change (drought in particular) has been at least partly responsible for the rise and fall of many ancient civilizations. • Our way of life depends on a stable climate. Faced with a changing climate, we must learn the lessons of past collapsed civilizations and adapt. Dr. Ron Blom uses satellite imagery to help navigate through sand dunes in the desert of Oman. Credit: Nicholas Clapp. 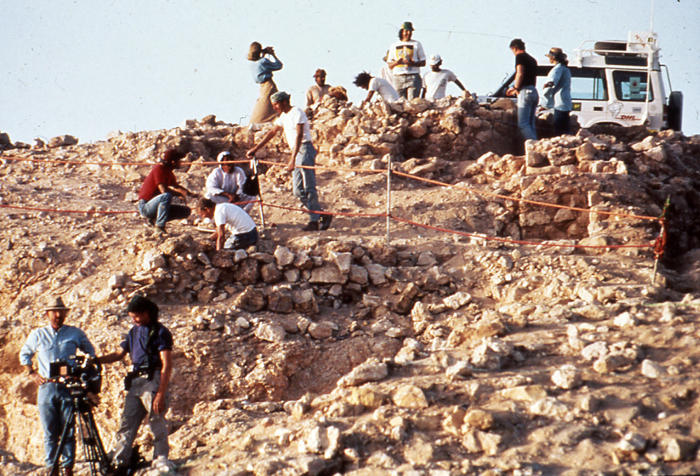 The photos above reveal a fortress emerging from sands excavated by archaeologists and volunteers at the Ubar site. Credit: George Ollen.